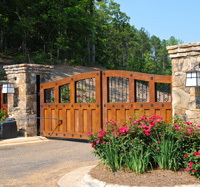 Our automated gate systems are intended to help you enhance your security system setup. Plus, as an added benefit your property value will increase. We only deal with top of the line gate automation that are ductile, durable, and blend in with the features of your property. If you are looking for a convenient solution to protect the perimeter of your property be it a residential or commercial installation required, our team at First Contact Fire and Security can help. Our team has installed 100s of automated gate systems and every one of our customers has given us top ratings for the quality of work and the surprisingly affordable prices we offer. If you would like a free no obligation quote, then please call us today on 02380 410 610 or 07751 205 754 or fill out our contact page. After Care Services: Once you automated gate system has been installed, we are always there to help if you need us. We also offer upgrades, repairs, and maintenance on existing systems. High-Quality Installations: We accept nothing less than a perfect installation. We won’t stop until the job is done no matter how awkward the installation is. We can solve any problem, so you can secure your property’s perimeter. 24/7 emergency call out service: If you have an emergency and need an engineer for on the spot repairs, then we are there at the drop of hat. Just pick up the phone and call us no matter what time of the day. Vandal Resistant Gates: As we are a security company, we know every trick in the book. We will make sure there is no way for vandals to tamper with your gate automation system, so you have 100% piece of mind. Visual Deterrent: A major benefit of installing an automated gate system is that it acts as a strong deterrent to thieves. There are easier picking out there, and as such your property will lower the risk of being targeted by intruders. Full Warranty: All our system come with a full warranty guarantee. However, to date with the systems we use, we have never had to replace a gate system installed by our team. We only deal with the best manufacturers. Complete Entry Control: You will have complete control over who can and cannot access the perimeter of your property operated from a central system or via card tap systems, security keycodes, or voice request access. Contact Us To Schedule A Free No Obligation Quote - You Will Be Pleasantly Surprised! If you are looking into the possibility of installing an automated gate system, and your property is in Southampton or Hampshire, call us on: 02380 410 610 or 07751 205 754 or fill out our contact page. Even if you are just looking for a quote because you are interested in how a gate automation system would work for you, we can help. We can also work with existing systems helping you to maintain, repair, or upgrade it. At First Contact, security is our number one priority. Our systems are available to add access control and gate automation to your existing or newly installed gates. From the traditional 5-bar gates, through driveway gates all the way up to ornate estate gates. Whether you just need a speech unit at your house or an added camera so you can see who is at your gate, then we can provide you with a service that you will be happy with. All of our gate automation systems come with a full warranty, and as an added bonus, you will always have our team to call upon when needed. We know some gate automation systems can be expensive – especially with the fees for installation applied. However, don’t worry because we know exactly how to work with those that are on a budget. First Contact Fire and Security has experience working on an array of commercial projects. There is no job too big or too small for our team. We have worked on large estates, new builds, office complexes, and in industrial zones installing automated gate systems for large international constructions firms that were looking for a company that could offer its local knowledge and experience. Looking For a Residential Gate Automation Expert in Southampton or Hampshire? Our expertise speaks for itself. For many residential property owners looking for an automated gate system, our company may seem more commercially focused. However, that is not the case. We have teams of experts that especially work on residential properties. In fact, we want more residential customers, so please give us a call and we will come up with a better quote than any other company in the Southampton and Hampshire area can offer. What Types Of Gate Automation System Solutions Can You Choose From? At First Contact Fire and Security, we know that one size never fits all. That’s why we have made sure that our team has been trained to have a keen eye for the right system for your circumstances. We have a range of systems available and an engineer that will be able to install it with 100% accuracy. That’s why we can help you install the perfect system to suit your property and most importantly of all to fit your budget. Just tell us what you need, and we can help. We will do all the hard work for you, so you can sit back and relax knowing that you are in good hands. Our quotes are free. We have specialists that you can arrange to visit your property at the best time for you. We can work around your schedule in order to give you a quote that has several payment options, price options, and system options. After you have decided which option you would like to pursue, all that we need to do is arrange a time and date so our engineers can come and fit your new system. Please get in contact with us because we really can say with confidence we offer the best gate automation services in Southampton and Hampshire. Call us on 02380 410 61054 or 07751 205 754. Or visit our contact page fill in the form with your name, mobile, email, a short message, and our friendly customer services team will be in contact within 24 hours (usually much much sooner than this! ).